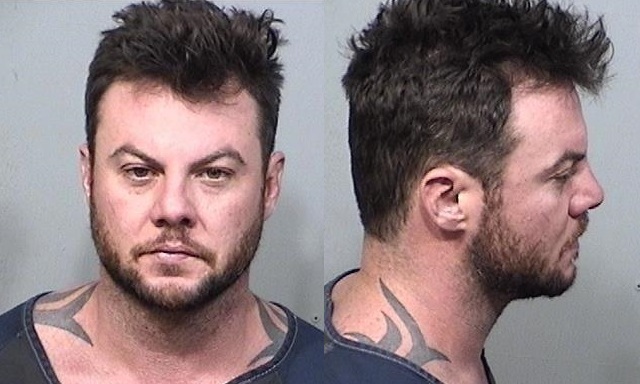 MELBOURNE, Florida - A Florida man was arrested after he allegedly passed out behind the wheel at an intersection while driving under the influence with a toddler on board on his way to pick up another child from school in Melbourne, Florida. According to the Melbourne Police Department, officers were notified of a motorist who was reported to be passed out behind the steering wheel of a vehicle. When police arrived on scene, they located a vehicle on Hibiscus Boulevard at the intersection of South Harbor City Boulevard. Police say that the vehicle ignition was turned on, in gear, and the driver had his foot on the brake. Police also say that they observed an open container of alcohol in 32-year-old Travis Paul Taffer's hand. After the officers observed a 16-month-old child in the backseat, they reached into the vehicle, placed the vehicle park, and woke up Taffer. Police say that it appeared to them that Taffer was under the influence of alcohol or other intoxicants. During the course of the investigation, also learned that Taffer was on his way to pick up a 7-year-old child from school. Taffer then underwent field sobriety exercises where officers determined the driver was under the influence of alcohol or other intoxicants to the point his normal faculties were impaired. The Satellite Beach man was arrested and charged with DUI, DUI with a minor in the vehicle, driving while license suspend with knowledge, and open container. He was later transported to the Brevard County Jail. The toddler’s mother responded to the scene to pick up the child.